Planet (and satellite) formation occurs by collisions, which can be energetic enough to cause global melting. During collisions, iron is delivered to the core of the growing planet, which has observable chemical and isotopic effects. Some recent work is summarized in a recent review article. Much of my work has involved combining modelling of planetary dynamics with calculations of the chemical consequences. This approach can tell us things like how fast Mars formed, and how the Moon and the Earth ended up with identical isotopic signatures. 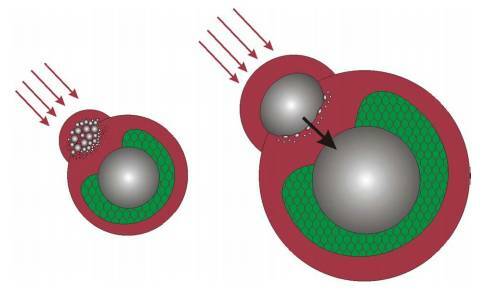 Most accretion simulations assume that all collisions result in perfect mergers, whereas in fact some collisions can knock chunks off the target. One of my former graduate students, Tina Dwyer, looked at how collisional erosion can affect the bulk chemistry and isotopic makeup of the surviving planets. Satellite formation works in a similar way to planet formation. At least for Jupiter�s moons, collisional erosion during accretion is not very important. But what is very important, especially for small moons, is the so-called Late Heavy Bombardment which happened about 3.9 billion years ago. This resulted in a large flux of high-velocity impactors which would have blasted apart the small moons several times over. Cartoon of how core formation evolves as a planet grows (taken from this article). The chemical effects of core formation depend on whether the incoming iron breaks up into cm-scale blobs or not. � Magnesium isotope evidence that accretional vapour loss shapes planetary compositions, R.C. Hin, C.D. Coath, P.J. Carter, F. Nimmo, Y-J. Lai, P.A.E. Pogge von Strandmann, M. Willbold, Z. Leinhardt, M.J. Walter, T. Elliott, Nature , 549 511-515, 2017. � Early differentiation and core formation: Processes and timescales F. Nimmo, T. Kleine AGU Geophysical Monograph v. 212, The Early Earth: Accretion and Differentiation , pp. 83-102, 2015 Preprint. � Formation of the Earth's core D.C. Rubie, F. Nimmo and H.J. Melosh, Treatise on Geophysics vol. 9, pp. 51-90, (G. Schubert, ed. ), 2007. Email me if you want a reprint.